The Color and Design course offered by Olivet School of Art and Design (OSAD) was one of several classes that highlighted the 2019 Winter quarter. Through the art of making color wheels and collages, students learned how to extract keywords from their design concept and use colors to derive their paintings. 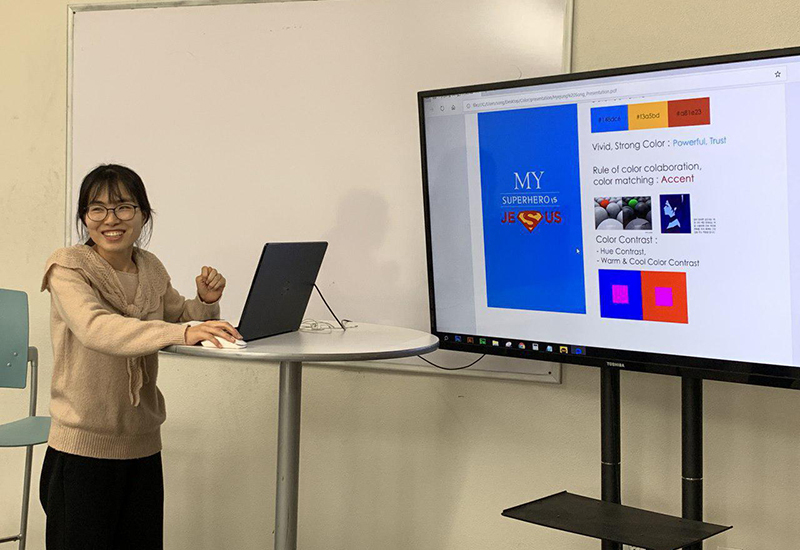 "It was a time-saving method for us to understand and select colors for our design work," said OSAD student Vicky Wang. On the last day of the course, students presented their final color planning project that reflected their color sense. The Digital Design Studio course focused on web coding where students learned the basics of HTML, Flex, and Wireframe. With new features in CSS, students were able to do perform coding more efficiently. In addition, the media query capabilities helped offer students more flexibility in creating responsive web designs. In the Sketch class, students used UX and UI development tools to create sketches. Instead of making workflows in Photoshop, students used sketches to prototype simple wireframes. The concepts learned from this class will help design students carry out their final projects in the next quarter. OSAD will continue to offer classes that will stimulate and nurture aesthetic senses in each student and help them articulate designs in a professional manner.